When war broke out in Europe in 1914 George was at Manchester (reason unknown) and enlisted into the 2nd Battalion of the Border Regiment where he was allocated the number 22099. He sailed out to France sometime after January 1916 and whilst overseas was transferred to the 7th (Service) Battalion of the Loyal North Lancashire Regiment where he was given the number 29717. He was later transferred over to the 10th (Service) Battalion. Unfortunately his service papers have not survived so not much more is known about his time in the Army except that he was still with the 10th Battalion when he was killed in action at Arras on 28th May 1917. The battalion war diary indicates that he was probably killed by enemy shell-fire; they had been occupying the right sub-sector in front of GUEMAPPE for the last four days. Fairly quiet until 23:00hrs when our line was heavily shelled. Captain Macnamara was wounded, also Second Lieutenant R.E.A Way. 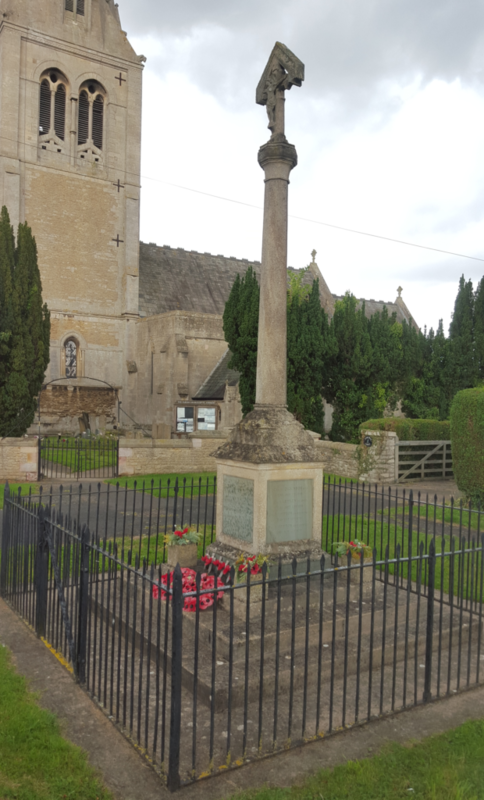 George is remembered on the Arras Memorial and also on the village memorial in Leasingham (pictured below). As his next of kin, Fanny received a war gratuity payment and would have received the British War Medal and Allied Victory Medal along with a memorial plaque and scroll bearing the name of her late-son and in recognition of his sacrifice. 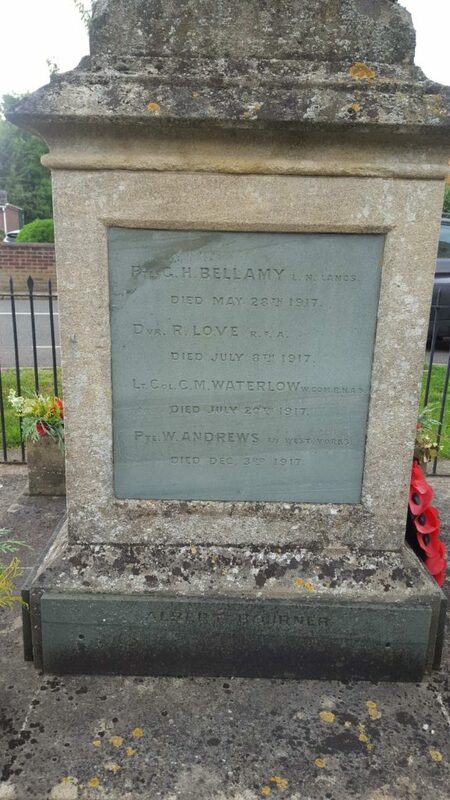 Richard and Fanny were living at Howell Fen near Heckington by time the CWGC were compiling their records; they later moved to Billingborough. An article about the couple on the occasion of their Golden Wedding anniversary in 1939 gives good information about their movements around these villages surrounding the market town of Sleaford. Mr. and Mrs. Richard Bellamy of Paris Court, Sleaford, formerly of Billingborough, are to be congratulated upon attaining the fiftieth anniversary of their wedding on Sunday, being married at Heckington Parish Church by the Rev. Geo. T. Cameron, M.A., on 21st May 1889. A native of Leasingham, Mr. Bellamy who is 78 years of age, commenced work on the land at the early age of 11, but a few years later took a yearly situation as a garthman, with Mr. C. Clark of Ashby de la Launde, where he remained for six years. Subsequently, for 29 years he was employed in a similar capacity by Mr. Thomas Bletsoe, of Leasingham, and when the latter retired from agricultural pursuits he continued with his successor, Mr. Ernest Mead, with whom he followed to Howell and Billingborough, and retired after a further 14 years service, when Mr. Mead left the latter village to take up another occupation at Barholm. For over 50 years Mr. Bellamy has attended Sleaford May Fair, and he considers the one just past was one of the poorest during the whole of that period. Five years her husband’s junior, Mrs. Bellamy is a native of Heckington, and of a family of 13 children, three sons and five daughters survive – one son was killed in the War, while four others died in their infancy. Both Mr. and Mrs. Bellamy enjoy remarkably good health for their years, and were able to visit their son-in-law and daughter, Mr. and Mrs. F. Carford, at Billingborough during the weekend, where the event was celebrated by a family re-union.